Taxes at customs points mostly come from imports which is growing by leaps and bounds. The drop in revenue has also exerted pressure on the government to meet its regular expenses as well as pay bills of infrastructure projects. 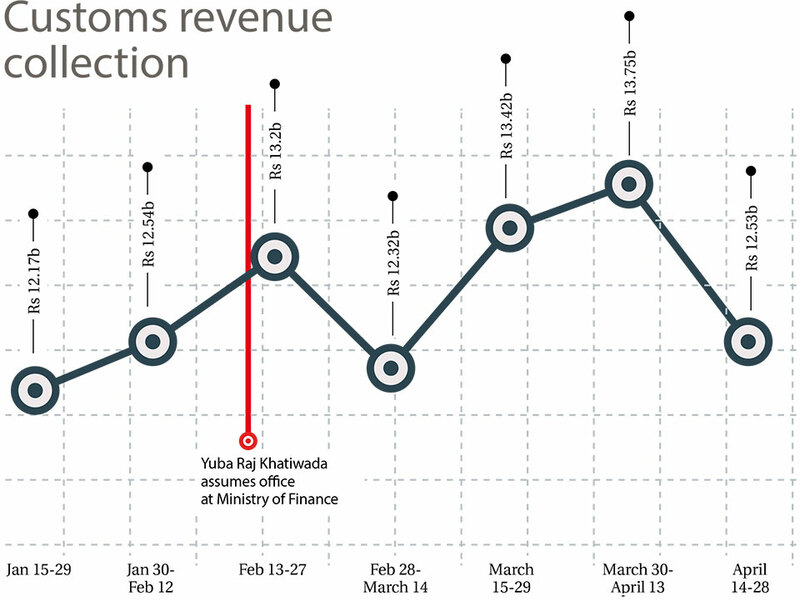 KATHMANDU, May 4:Statistics compiled by the Department of Customs (DoC) shows that revenue collection saw a minor improvement from the last week of February. But the growth did not sustain for long. Revenue collection data of the second half of April shows that revenue fell to the level of February last week when Minister for Finance Yuba Raj Khatiwada assumed office. This means the measures taken by the new finance minister to improve revenue collection failed. This also implies that anomalies like under-invoicing at customs point are continuing unabated. Revenue collection from all three dozen customs points was Rs 12.32 billion in the 15 days (between February 28 and Mach 14). Collection increased to Rs 13.75 billion between March 30 and April 13. But it fell to Rs 12.53 billion between April 14 and April 28. None of these collections met the periodic targets given for the 15-day period. Improving tax collection at customs points and stopping anomalies to reduce tax evasion were some of the measures announced by Khatiwada after he assumed office on February 26. The technocrat, who was picked for the finance portfolio, sidelining many politicians, had also announced to end anomalies at customs points. Under-invoicing of imported goods at customs points is one of the many ways used by importers to evade taxes. It also helps traders to evade income tax as wholesalers and retailers do not issue bills to customs as the value of goods at the customs is quoted very low. Taxes at customs points mostly come from import which is growing by leaps and bounds. The drop in revenue has also exerted pressure on the government to meet its regular expenses as well as pay bills of infrastructure projects. Director General of the Department of Customs (DoC) Toyam Raya blamed the significant drop in customs tax to falling import of motor vehicles in recent week. He also said that import of low-value goods is increasing in recent months which means low customs taxes for the government. An assessment made by the DoC on the drop in customs revenue submitted to the finance ministry last week attributed the drop in revenue to a number of factors like disturbance in import in eastern and central Tarai due to floods in August, and fewer imports of raw materials like clinker used by cement industries. The assessment report submitted to the finance ministry also says states that the target of 28 percent growth in customs revenue in FY2017/18 was very ambitious compared to 22 percent growth achieved in the last fiscal year. 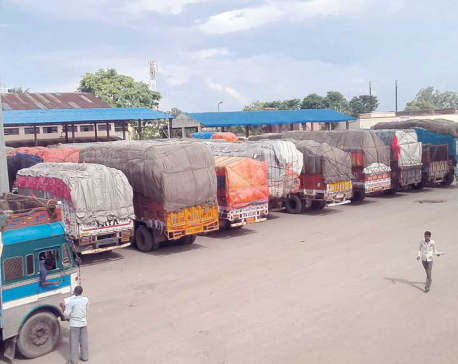 Despite the move of Minister Khatiwada to control anomalies at customs point, traders complain that corruption is still going unabated as they have to bribe customs officials to release their consignments like in the past.